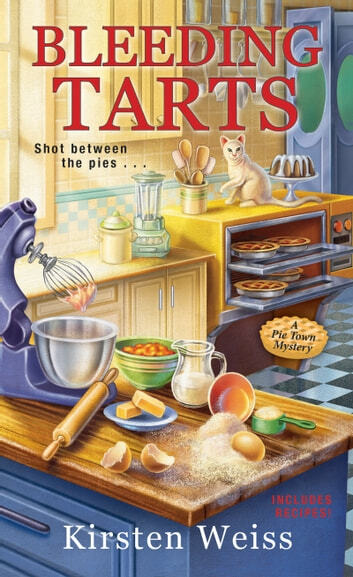 Bleeding Tarts by Kirsten Weiss is the second slice of A Pie Town Mystery series. Val Harris owns Pie town in San Nicholas, California. Val along with her crust maker, Charlene McCree are taking pies out to the Bar X (an Old West ghost town available for events) for a pie eating contest. Val is hoping to get a contract to regularly supply pies from the owner, Ewan Frith which will help her struggling business (she has hired too many employees). Val is carting the cherry pies to the saloon when a shot rings out and shoots one of the pies splattering her with cherry goo. Val ducks into an alley and finds a man dead on the ground, and he is not playing opossum. Who was the shooter aiming at? The victim is Devon Blackett who was the bartender for Bar X. With Val once again a suspect in a murder case, her dinner date with Detective Gordon Carmichael is canceled. Charlene is determined that they (Baker Street Bakers) will solve the case especially since her archrival, Marla Van Helsing has decided sleuthing is her new profession (she even printed up cards). The killer, though, is a nasty varmint who wishes to derail their sleuthing by taking out Val. Then a second Bar X employee is killed. Val and Charlene need to work quickly before the Bar X turns into a real ghost town. Bleeding Tarts is a humorous, quick paced cozy mystery. While this is the second installment in A Pie Town Mystery series, it can stand on its own. There are numerous quirky characters along with zany antics sprinkled throughout the story. Heidi, who own Heidi’s Gym, is back and she has increased the size of her “Sugar Kills” sign (her business is next door to Pie Town). Charlene is still going around town with Frederick, her cat, draped about her shoulders. Marla Van Helsing is a black widow (all of her husbands were rich and are now dead) on the prowl for her latest victim (i.e. husband). Val needs this venture with Bar X to be a success since her business is doomed without it. She has taken on too many employees and there is not enough money coming in to support them (assistant manager, pie crust maker, dishwasher, pie maker). It might help if she did not have coffee available for customers on the honor system (put money in a jar). I think Val should take some business classes or get a good accountant. Let us not forget Charlene’s obsession with ghosts, fairies and all things extraterrestrial. She is not sure if the problem in the local park is a ghost or if fairies have moved in. I did love the Samantha Carter, Rodney McKay, and Dr. Zelenka references (fans of Stargate SG-1 and Stargate Atlantis will get it). I wish the mystery had been a stronger. There are a limited number of suspects, and I was able to identify the guilty party. There is some misdirection that could send readers down the wrong trail. My rating for Bleeding Tarts is 3 out of 5 stars. Bleeding Tarts will have you laughing from the very first page as Charlene drives them out to the Bar X (she should have her license taken away).